Important information on how to obtain a CoE and apply for a student visa if you are a future or current student. Learn more about La Trobe University's and international students' responsibilities. 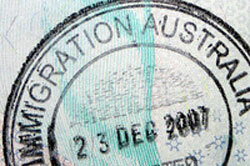 As a condition of your student visa, it is important that you have a current health insurance. Read about costs and coverage and how to find a medical centre or hospital in your area. Do you want to bring your family over to Australia while you study? View the legal requirements for having your family join you as dependants and information to help you arrange a childcare or school for your dependants. Find out about how much part time work you are allowed to undertake while in Australia on a student visa.